New Delhi Sep 15 (IANS) Prime Minister Narendra Modi on Saturday travelled in normal Delhi traffic without the customary protocol and participated in a cleanliness drive at a school volunteering for service. "The Prime Minister travelled to and from the school in normal traffic and without customary protocol. No special traffic arrangements were made for his visit " a statement said. The no-frills-security drive was a big surprise. "We were not briefed about the the Prime Minister s visit. The traffic plied normal and there was no special arrangement " said a traffic police officer. Shortly after launching "Swachhata Hi Seva" movement the Prime Minister interacted with common people and promenent personalities from diverse fields through video conferencing at 17 locations. The Prime Minister then travelled to the Babasaheb Ambedkar Higher Secondary School at the busy Rani Jhansi Road in central Delhi. 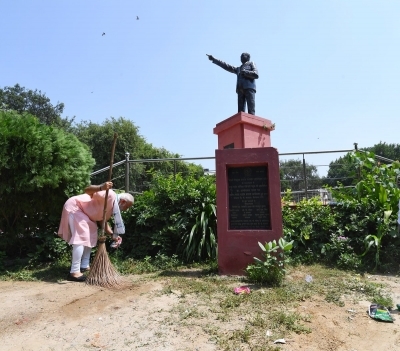 He offered floral tributes to a statue of Ambedkar and participated in the cleanliness drive. He also interacted with the students and exhorted them to adopt cleanliness. This school campus was bought by Ambedkar in 1946 with an aim to advance the educational social and economic well-being of the Scheduled Caste community.